Research done by Barbara A. Smith, Harold Lee Smith's sister-in-law, and Claradell Shedd, class of 1953. Harold Lee Smith graduated from North High in the June, 1964 class. His service number was 54925671. His next of kin is shown as Elbridge R. Smith, 3830 7th Street, Des Moines, IA. "1327 Fr A Co: Had sniper fire on 2nd platoon. 1 man hurt serious condition. Loc coord BS 701935. Medivac called 1330. Completed 1345. Engaged 3 to 4 riflemen 300 to 400 meters SW of their position. Approx BS 699929"
PFC Harold Smith was wounded in this incident, which occurred near An Tho hamlet, 11 kilometers east of Binh Son; he died two days later, on 09 Feb 1968. I am Harold Lee Smith's sister in law. 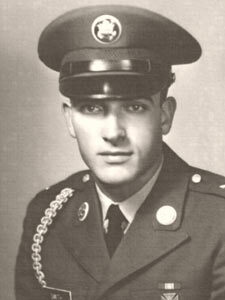 Harold was killed during the Tet Offensive in 1968. He had just turned 22 a month before that.My daughter now serves as a Staff Sergeant in the Air Force. A few years ago she made up a picture of Harold with the "Wall" behind him. Thank you so very much ... and God Bless America! 24 Nov 2005 I regret not having known my brother-in-law Harold. Through my husband Dale, Harold's brother, I was able to get to know him a bit. Harold and Dale were as close as brothers could be. When Harold was killed in action during the "Tet Offensive", it shattered many lives, as it did other families and loved ones that had to say "goodbye" to loved ones killed or missing in action during the Vietnam conflict. Harold's story is just one of many thousands. Dale was stationed in Taiwan when Harold was sent to Vietnam. Dale had just finished a second tour in Nam. He chose to go to Taiwan after that because he could not cope with the sentiments of some Americans here at home who rallied against the U.S. presence in Vietnam and our brave soldiers fighting for what was right. Harold was "Infantry" and went out on patrol with his comrades in February of 1968. Not too long into the patrol they were ambushed. Harold was shot in the head. There were also a few others that were shot and killed instantly by enemy fire but Harold did not die right away. They were able to get a copter to airlift him out for emergency medical treatment. Harold lived for 3 days, but nothing more could be done for him. Word was sent immediately to his parents that he had indeed been seriously wounded. I remember reading a letter from Harold's mother to her son. She told him how much she loved him and it broke her heart that she could not be there to be with him. One sentence will be forever on my mind from that letter. That is this.. "Please son ... please hold on ... we love you so much ... we are praying so hard for you ... we love you so much." Dale got word of Harold's injury and then his death. He asked that they not notify his parents until he was able to get home to Des Moines to soften the blow. He did in fact get home but was home for 3 days and no word had come. On the third day he was able to get to the phone while his parents were in the back yard to double check and in a sense, was hoping against hope that this terrible news was perhaps a mistake. As he picked up the phone to verify matters, he saw a car pull up out the window with uniforms and a chaplain exiting and walking up the sidewalk. He knew then the information was correct. Harold was buried in Des Moines with full honors. For many years after that, Harold's mother was in deep, deep mourning. At Christmas time she could not bear to hear "I'll Be Home For Christmas." Dale lost his best friend and became more bitter at the demonstrations going on here at home. He returned to Taiwan for a few more years. His father kept his anger and pain inside. I do remember a story or two about Harold. When he was a small boy and into the "cowboys and Indians" stage, he and his friends were building a fort to fight off the Indians. They were all dressed in their cowboy get-ups. Harold's friend had a pitchfork and Harold had a shovel. His friend went to stab the ground so they could dig and missed. The pitchfork went through Harold's cowboy boot, through his foot and out the sole of the boot. In those days the doctors came to the home in emergencies. The doctor got the pitchfork out and the boot off. (Harold was upset that his boot had to be cut off.) The doctor then saw the gaping hole in Harold's foot. He took a sterile rag with antiseptic and ran that rag in and out to help prevent infection. Ironically there were no broken bones. Both Harold's parents are dead now, as is Dale. I think of the entire family together once again in spirit and in no pain. The pain is left here with us. It does help to read memorials on a wonderful website such as this, and knowing that others want to keep memories alive helps many families and friends a great deal. Harold's flag sits in a case beside Dale's flag case. (Dale died in 2002 and is buried at Arlington.) I choose to have both brothers remembered side by side. They were both wonderful men... strong in will and patriotism, and strong with love for family, and each other as brothers. My two children, my son Doug Smith and his wife Meredith in California, and my daughter (Staff Sergeant, USAF) Maureen Stewart and her husband TSgt Glenn Stewart, will always make sure their children remember not just their Grandpa Dale, but their Great-uncle Harold, as well as the contributions and ultimate sacrifices that were made in the name of freedom.